28 ROOF COATINGS 2018 COATINGSPROMAG.COM By Joe Stockdale, Industry Relations Expert at Accella Polyurethane Systems Photos Courtesy of Spray Foam Coalition Spray Foam Off ers a Storm-Sturdy Roofi ng Option T he right fi t for the climate is a key concern when choosing a roofi ng system, and spray polyurethane foam (SPF) makes it an attractive option for many parts of the United States. is is notably relevant across the Midwest and South, where frequent thunder and hail storms are the norm, and a durable roofi ng system is needed to help protect against Mother Nature's wind and icy fi ts. Acrylic coatings came into the market in a big way with the development of formulations that stayed much whiter over an extended lifespan. W hile the term "cool roof " did not yet exist, it became obvious that a white coating could make for a longer lasting, more energy-effi cient roof. e elements of heat reduction, decreased thermal cycling, and high perme- ance proved invaluable in preserving the high R-value of SPF. It is the versatility that SPF, also called spray foam, off ers — both through its application and how it resists wind and impact — that makes it a top choice for a variety of climates, including regions susceptible to severe thunder storms and hail, explained Will Lorenz, vice president of sales for General Coatings Manufacturing Corp. "As spray foam provides insulation directly to the roof, it reduces heat energy fl ow into or out of the structure," Lorenz said. " 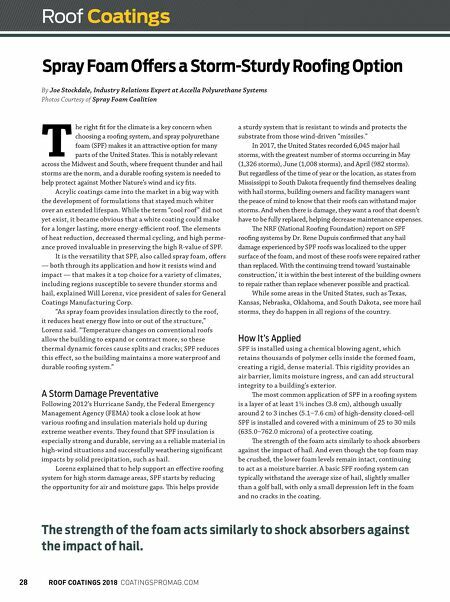 Temperature changes on conventional roofs allow the building to expand or contract more, so these thermal dynamic forces cause splits and cracks; SPF reduces this eff ect, so the building maintains a more waterproof and durable roofi ng system." A Storm Damage Preventative Following 2012's Hurricane Sandy, the Federal Emergency Management Agency (FEMA) took a close look at how various roofi ng and insulation materials hold up during extreme weather events. ey found that SPF insulation is especially strong and durable, serving as a reliable material in high-wind situations and successfully weathering signifi cant impacts by solid precipitation, such as hail. Lorenz explained that to help support an eff ective roofi ng system for high storm damage areas, SPF starts by reducing the opportunity for air and moisture gaps. is helps provide a sturdy system that is resistant to winds and protects the substrate from those wind-driven "missiles." In 2017, the United States recorded 6,045 major hail storms, with the greatest number of storms occurring in May (1,326 storms), June (1,008 storms), and April (982 storms). But regardless of the time of year or the location, as states from Mississippi to South Dakota frequently fi nd themselves dealing with hail storms, building owners and facility managers want the peace of mind to know that their roofs can withstand major storms. And when there is damage, they want a roof that doesn't have to be fully replaced, helping decrease maintenance expenses. 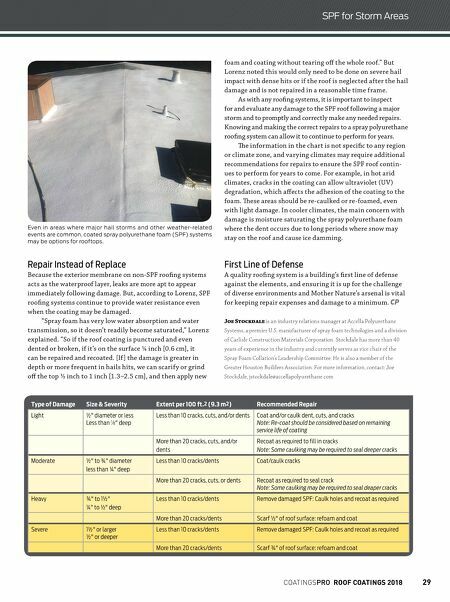 e NRF (National Roofi ng Foundation) report on SPF roofi ng systems by Dr. Rene Dupuis confi rmed that any hail damage experienced by SPF roofs was localized to the upper surface of the foam, and most of these roofs were repaired rather than replaced. With the continuing trend toward 'sustainable construction,' it is within the best interest of the building owners to repair rather than replace whenever possible and practical. While some areas in the United States, such as Texas, Kansas, Nebraska, Oklahoma, and South Dakota, see more hail storms, they do happen in all regions of the country. How It's Applied SPF is installed using a chemical blowing agent, which retains thousands of polymer cells inside the formed foam, creating a rigid, dense material. This rigidity provides an air barrier, limits moisture ingress, and can add structural integrity to a building's exterior. e most common application of SPF in a roofi ng system is a layer of at least 1½ inches (3.8 cm), although usually around 2 to 3 inches (5.1‒7.6 cm) of high-density closed-cell SPF is installed and covered with a minimum of 25 to 30 mils (635.0‒762.0 microns) of a protective coating. e strength of the foam acts similarly to shock absorbers against the impact of hail. And even though the top foam may be crushed, the lower foam levels remain intact, continuing to act as a moisture barrier. A basic SPF roofi ng system can typically withstand the average size of hail, slightly smaller than a golf ball, with only a small depression left in the foam and no cracks in the coating. Roof Coatings The strength of the foam acts similarly to shock absorbers against the impact of hail.